The Greg Abbott - Take back Texas Conservative rally was a HUGE success! This will be an ANNUAL RALLY from now on! We had SOOO many Republican candidates and elected officials like all the area’s local Republican candidates to State Board of Education to State Senate and State Reps to Appeals Judges and Attorney General Greg Abbott! 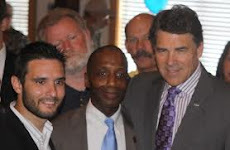 Never have we had an event in southeast Texas with all the area Republican candidates and officials. This was an amazing opportunity to meet candidates from the entire area all in one place and it was an awesome get out the vote rally right before the election. So we decided that we will do this every year before the election. Below are a few pictures from the rally. Contact David Bellow to be a part of this yearly area-wide Conservative Republican rally! Thomas Tyler Jr. - Silsbee Democrat JP Candidate - Did you Beat your Girlfriend? Did You Beat Your Girlfriend? 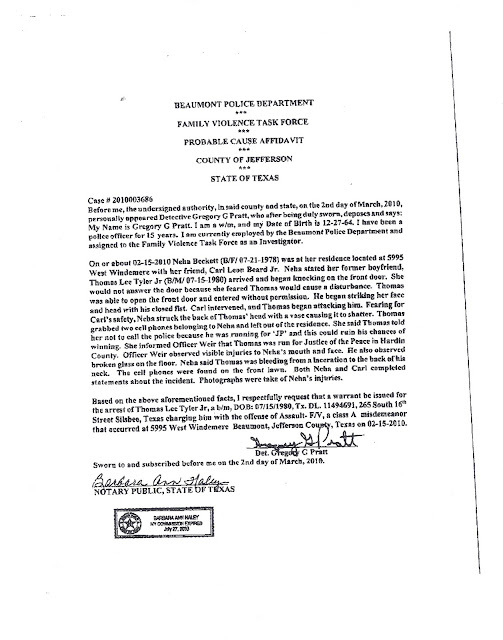 In March 2010, the Beaumont PD Investigating Officer for Case# 2010003686 requested an arrest warrant for Thomas Tyler Jr. for allegedly breaking into his former girlfriend’s house and beating her in the face with a closed fist. It is America and anyone has the right to run for office, but before people decide who they will vote for you need to explain your actions to the Silsbee voters. These are not minor speeding infractions. THIS IS ASSAULT. Also, was that you patting the New Black Panther Party's Quanell X on the back when he was screaming about burning down a city because a man crashed his car, was on drugs, fought the police and was tazed and because of the drugs he died.... Do you advocate burning down Lumberton or were you just patting him on the back because you wanted him to move out of your way so you can pass by? This was not easy for me to post about Tyler. I ran for office and I know how bad the lies about candidates can be because I had lies made up about me. 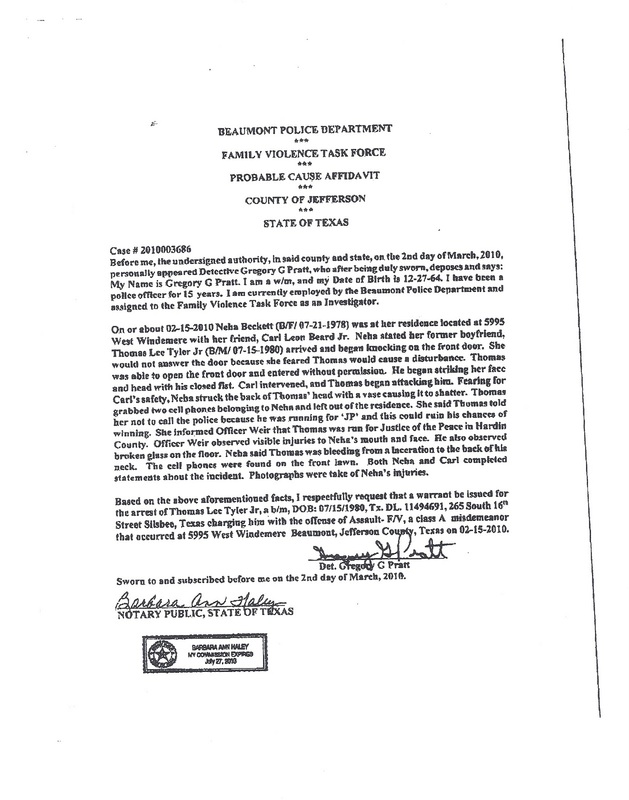 I personally spoke with a couple officers at the Beaumont PD who were involved in this and they really do believe Tyler did this and are upset it was swept under the rug for no reason with so much evidence that Tyler did this. Only after talking with Beaumont PD did I decide that the people need to know about this because Tyler is running for public office. Early voting for the general election will take place from Oct. 18 through Oct. 29 at the Hardin County Courthouse, located in Kountze. Weekday polling will take place from 8 a.m. to 5 p.m. On Saturday, Oct. 23, voting will take place from 9 a.m. to 4 p.m., and on Sunday, Oct. 24, residents can vote from 11 a.m. to 4 p.m. Branch voting is available in Silsbee, Lumberton and Sour Lake. In Silsbee, voting will take place on Tuesday, Oct. 19 from 9 a.m. to 7 p.m. at the Silsbee Community Center. Early voting in Lumberton is available on Wednesday, Oct. 20 from 9 a.m. to 7 p.m. at the City Hall. And, in Sour Lake, residents can cast their early ballots at the Community Center on Thursday, Oct. 21 from 9 a.m. to 7 p.m.
Show up to the redistricting meeting on Monday and tell them that they need to redraw the lines so that Republicans are given a majority of the new US Congressional seats, which is only fair because the Texas Statewide elections have proven that a majority of voters in Texas are Republican. It is only right that the redrawn lines reflect the fact that a majority of Texans are Republican. What people say at these meetings could be play a big role in how the lines are drawn. renamed "Jim Gilligan Way"), Beaumont, Texas, 77705.